I think we’ve all heard of service and therapy dogs, but I doubt many people realize that there are also service and therapy rats helping humans live better lives. Before she got her first rat, Dani couldn’t go out and enjoy life doing the things most of us take for granted such as going to the mall or Disneyland. “I could only go to one store, then straight home, because I never knew when the spasms would hit and if they hit bad, I can’t drive! 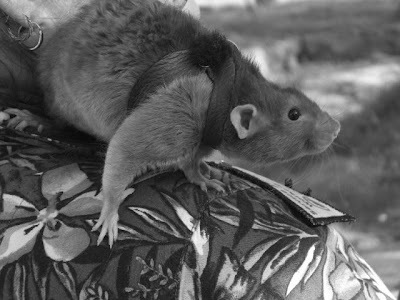 Once they were established, they were almost impossible to get rid of so I would spend weeks in bed, in pain, unable to function!” Her rats ride on her shoulders wearing their soft leather harness and leash with a bright yellow tag that says ‘Service Animal Working, Please do not touch’. Unfortunately for Dani and others like her, things changed on March 15 of this year. Dani stated that up until then all she needed to do was be responsible for their training and behavior in public. Now the official definition of a service animal is “Any DOG trained to perform specific tasks such as guiding the blind and alerting a deaf person to sounds.” All other animals except miniature horse guide animals are now excluded and all emotional support animals are excluded, even dogs. For anyone wishing to help in the fight to reverse the changes to the ADA and support education of businesses, Dani is a part of a Facebook community called “Save our service animals“. Jennifer’s therapy rats have been present for several sessions now.“They are curious and happy about seeing a client come in to the office. Their regard for my clients does wonders for their self worth. Rats are also a great conversation starter and simply the act of petting one helps people to relax. Most of my work is done with kids and the rats have helped some of the quieter ones really open up.” With adult patients Jennifer likes to use rats need for community and ability to survive against all odds as a metaphor. She hopes that more people will train rats as therapy animals and plans on continuing to do so herself. Reaction of patients so far has been great with many being surprised how cute and sweet rats are. “I hope that I can help change some opinions about a rat’s place in psychology; I don’t feel it is just in the maze or the lab. I think rats have a place in the counseling office and in direct clinical work with clients.” You can learn more about Jennifer by going to her work profile. She would love to hear from anyone with more questions about therapy rats. Rats are helping their humans all over the world in so many ways—searching for land mines, screening for TB, drug sniffing and as therapy and service animals. Perhaps it’s time the world started rethinking their views on this brave, social creature who wants to please and help humans just as much as any dog. Maybe rats will be man’s new best friend. You can learn more about the new ADA regulations by visiting their website. Thank you for printing this interesting article. Jennifer is an amazing woman, doing an incredible job. How short-sighted can the government be. Pretty obvious that the people who made these decisions and their relatives and friends, have no need of service animals or they would be singing a different tune. I think it is great that rats can be used as service animals! Now the governments needs to be convinced. I wonder if they can be used for diabetics that are hypo unaware? I’ve owned rats for 3 years and loved them from a distance for as long as I can remember. It can be very disheartening to hear people react negatively toward rats for no reason. This article shows just how amazing rats can be. I can only hope that more towns start to recognize service rats, especially for people with issues that would be difficult for a dog to help with. This is a beautiful thing. I hate to say this, but a rat is a rat is a rat. Well everyone is definitely entitled to their opinion, but for those of us who have gotten to know domestic rats as pets–they are wonderful, loving, intelligent creatures. I think rats are amazing, intelligent, compassionate creatures, they are the perfect animal for therapy, a rat is a rat is a rat, and they are wonderful!! I found this article really interesting. 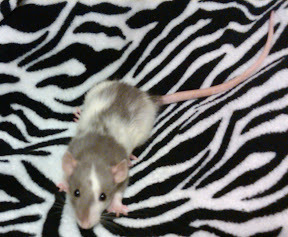 I have three female rats who are lovely! I also work as a TA in a secondary school in London (UK) with children with special needs, and i have found a mixture of confusion and curiosity when i mention i keep rats as pets. A few have expressed a desire to meet them in the past. I sometimes wonder if a therapy rat would be of benefit to some of the kids with aspergers and/or difficulties with social interaction that are in our school. Is this something rats have ever been used for? I once heard of a teacher who had a cat in her office (at my own secondary school when i attended) that she would use it to get the kids to relax and open up. I know how relaxed and at ease you can feel when having a fluffy critter to cuddle. Its something im curious to learn more about, any tips on where to find info? After struggling with my child who has aspergers, we were recomended a dog to help learn social clues. But not living in a house where wr can keep dogs, i decided on a rat. Rats actually. We have three females. And we have daily lessons on watching for body language and what to do when certain situations arise. And even when he is too rough or too hyper, they love him amdcuddle and kiss like nothing happened. Great animals! I would recommend over and over! This was a fascinating read. I recently lost my therapy rat, Sonic. I’ve outlined a funeral to be performed this week. I had him cremated and he will go on either my bookcase or my dresser. I have severe social phobia and agoraphobia. I wanted to take more control and do something about it. But we can’t afford a dog, so I started researching and came across rodents. I was thinking about a chinchilla but then I thought, rats are easy to care for, not expensive and relatively healthy animals. People don’t realize how social these animals are. Rats, dogs and horses are so social, part of why they mingle with humans so well. I came across Sonic in Petsmart, the recommended place to get a rat, and he was so calm, I thought he would be better for me. My mother warmed up to him instantly, my dad took a while. But in this past year, Dad’s called him Ratatouille, Lester, Herman and anything but his actual name. I would love for rats to be legal and to be able to train them that way. I’d love to take a rat out of the house with me. Sonic did help a tremendous change in me. I recently got my driver’s license. I’m getting better at noticing my panic attacks. Not to mention, he helped me so much with my depression. And all this with a rat, who was not trained as a therapy animal. They say therapy and service animals are not pets. I disagree. Petting is therapeutic and an animal becomes a part of you. It is a pet. It’s family. I think this is a wonderful thing, and as a personal suffering from depression and anxiety my rats definately make me happy and my anxiety and depression have lessened. I was wondering if anyone could help me. I’m trying to do a very simple writing passage concerning this topic geared toward 2nd and/or 3rd graders. What I’d like to know is if anyone has any insight as to how therapy rats are trained. Source materials, interviews, or even contact information for the people mentioned in this article would be awesome. I find this topic to be fascinating and believe kids will as well. 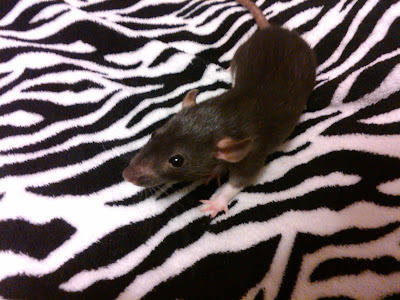 I have come to own my first rat “Venus” almost 3 months ago. She is an albino fancy rat. Since I first aquired her, I have found my mood and temperment much easier to deal with. I had stage 3 1\2 testicular cance and pronounced to be bi-polar. With failed marriages, not being able to see my daughter due to her mom, and serving state time which changed my perspective of people, Venus keeps me on an uplifted note and calm. I take Venus out for walks,( well I walk as she rides on my shoulders). Lol. We use to go to the flea market every weekend until I was told that I could no longer bring her with me. Yet people are allowed to bring their dogs of various breeds and size. Pits to toy poodles are brought in without a word said to them as they do their business where people walk. Yet, I’m told that I can’t have a trained rat which brings me greater peace and great joy. That sounds great! I love rats as well and I have had two of my own. I adopted them from the same place in I believe the same litter. My one little boy ended up dying after a year and a half, but at two years my ol’ man is still alive and kicking his oncoming hind leg paralysis. I wish you all the luck with making the government change its mind, and I hope the best for you and your little ratties!